John Russell, guitar; with: Henry Lowther, trumpet (track 1); Satoko Fukuda, violin (track 1); Phil Minton, voice (track 2); Evan Parker, tenor saxophone (track 3); John Edwards, double bass (track 3); Thurston Moore, electric guitar (track 4). Recorded at Cafe Oto, London on 19 December 2014 at John Russell's 60th birthday gig. 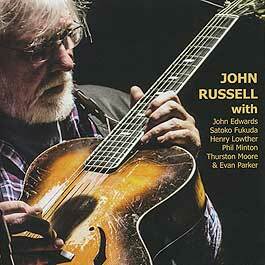 Photograph (front cover reproduced above) from John Russell's 60th birthday gig by Andy Newcombe.